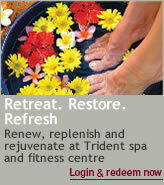 We are delighted to share the world of Trident Privilege with you. Avail our exciting offers and enjoy the wide spectrum of privileges with each tier. You will find that our generous guest loyalty programme is truly rewarding. Trident Privilege Programme has three tiers - Red, Gold and Platinum. The benefits and privileges are based on your membership tier.